Iraq's Prime Minister, Nouri Maliki, has called for a summit of the nation's main political factions in an attempt to break Iraq's political paralysis. In recent weeks almost all Sunni members of the cabinet have quit. Others are boycotting meetings, leaving at least 17 cabinet seats empty. Many of them have accused Mr Maliki, a Shia Muslim, of ignoring their demands. A BBC correspondent says the crisis is worrying for the US, which wants to see progress before withdrawing troops. "I have called the political leaders for a meeting to discuss the main issues in the political process. The first meeting may happen tomorrow or the day after tomorrow," Mr Maliki announced on Sunday. A senior Kurdish leader, Massoud Barzani, has already arrived in Baghdad for the talks. It is expected he will play a key role in the negotiations, says the BBC's Richard Galpin in Baghdad. 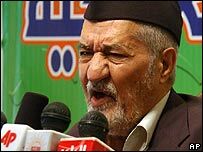 In particular he will try to get the Sunni parties to decide whether to rejoin the government or go into opposition. Many Iraqi MPs are not in the Iraqi capital at present because parliament is in its summer recess, which does not end until next month. Mr Maliki has been unable to push forward with his plans for national reconciliation without the support of the country's various factions. The so-called national unity government has effectively disintegrated, says our correspondent. The main Sunni bloc, the Iraq Accord Front, pulled out on 1 August. Last week, another five ministers, loyal to former Prime Minister Iyad Allawi, began a boycott. And the Shia followers of cleric Moqtada Sadr withdrew months ago. But despite summoning leaders from all sides for talks, there is no indication that Mr Maliki is willing to make any concessions towards them, Richard Galpin says. 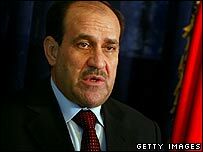 Mr Maliki said he wanted Sunni Arabs to play a role, but warned that if the Accord Front was not ready to rejoin, he would bring in others. "There are people who have come forward and offered to be an alternative," the prime minister said. There was speculation he could be referring to tribal sheikhs in western Iraq who have allied with the government and led a Sunni backlash against al-Qaeda insurgents. Saleem Jubouri, a senior member of the Accord Front, told Reuters the group had no plans to return to government but remained committed to dialogue. However, the leader of the Accord Front, Adnan al-Dulaimi, launched a broadside against Shia links with Iran in an email to the Associated Press. He alleged there was "an unprecedented genocide campaign by the militias and death squads that are directed, armed and supported by Iran". Countless murders have been carried out against Sunnis by Shia death squads, forcing Sunnis to flee whole districts of Baghdad. Iran has denied similar accusations from the US that it has armed or trained the militias. Iraqi Sunni parties have complained that Mr Maliki is too close to Iran, and Mr Dulaimi's email arrived only a day after Mr Maliki returned from a visit there. Sunnis are not the only victims of Iraq's sectarian violence. Thousands of Shia have been killed and wounded in Sunni militant bomb attacks.